When it comes to shopping, I rarely buy anything at full price. It's been a long time since I've actually needed an article of clothing. These days, most of my purchases are because I want it. 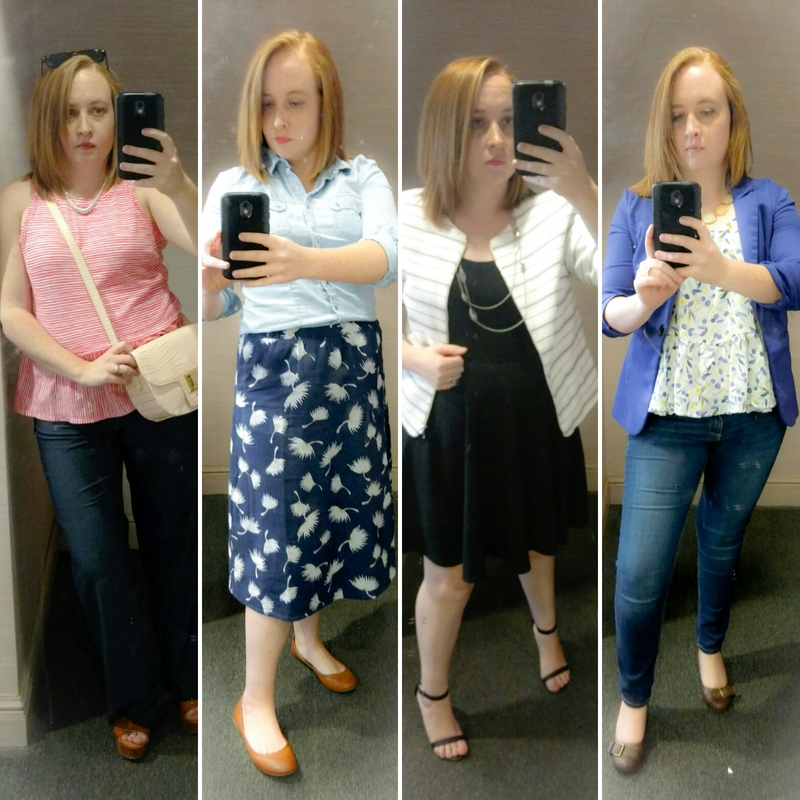 These pieces from Old Navy (red shirt, blue skirt, black dress, patterned shirt) are no exception, and I got them all for a great price thanks to a sale and extra 30% off code. I ended up paying less than $50 for all four items and got free shipping. Nothing is more satisfying than getting a great bargain on things you love as soon as you try them on. We'll start with arguably the most laid-back item in this purchase - the red-and-white-striped relaxed peplum top. I've seen relaxed peplum in several places but always thought it looked sloppy. A recent trip to our local Old Navy brought me face-to-face with this top in a different pattern and I kind of fell in love. This shirt is so effortlessly cool. 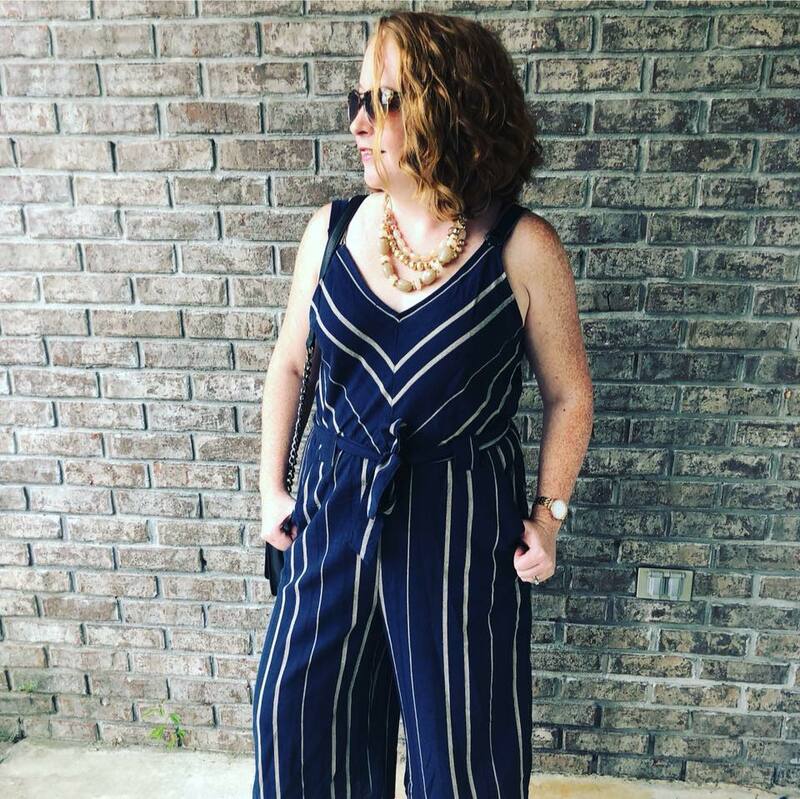 It's insanely comfortable, the slight peplum gives it just enough oomph to make me feel like my outfit has substance and the peplum perfectly covers up my mom tummy. I'm usually a S/M in Old Navy and am wearing a M.
This skirt is going to be an integral part of my wardrobe moving forward. It's fully lined and the elastic wasteband has plenty of give. I paired it with my oh-so-versatile chambray shirt and cognac flats for a more relaxed look but it wouldn't be difficult to dress it up a little. I read the reviews before ordering and will agree that the sizing is runs large. I'm wearing a petite small. Fact: You can never have too many LBD's, and this one from Old Navy is a great basic. It has adjustable spaghetti straps and a hidden side zipper. It isn't lined but the material is just thick enough to not be see through. The one draw-back is that it wrinkles very easily. I'm wearing a medium. I also want to brag on this jacket a moment. It's regularly priced way over my budget but I combined a coupon on top of a sale and a card-holder discount to get it for more than half off! I just can't seem to say no to the peplum trend. This shirt is pretty thin but not sheer. It has adjustable spaghetti straps (mine are tightened almost all the way). It's hard to tell in this picture but it has blue, purple, green and yellow in the design, which make for so many options when it comes to accessorizing. I do love how this blue blazer compliments it though! I'm wearing a medium.